Big things are happening at Victorian farmers markets this weekend. VFMA and Locavore have some great tips. As part of the City of Melbourne 2013 Arts Grants Program, artist Lloyd Godman will install Airborne – the world’s largest series of super-sustainable rotating air gardens – at the Queensbridge Pedestrian Precinct, Northbank. The first installation will coincide with the Sustainable Living Festival (9 February) and further air gardens will be installed throughout 2013. 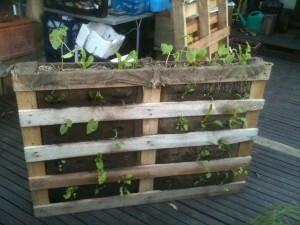 HoBoGro are holding a vertical pallet garden event in Redfern on Saturday (14 September) 1-4 pm. See more here on their Facebook page. Sydney, but you don’t have to leave the house! The Good Hood is about celebrating all the Good things we’re doing to make Sydney a better place – like recycling, reusing, making, growing and living more sustainably. We want to hear about all the Good stuff you’re doing so feel free to pin as much Good as you can. Simply snap a photo of your Good and upload it to our map, then share it and see Good stuff going on around you in our city’s villages. Participate in Canberra’s first interactive market on Sunday 15 September 2013 –it brings together products and community groups focused on domestic green sustainable living. See Green Savvy Sunday at the old bus depot markets. Make your building a Smart Block!